I’m making some progress with blind drawing. I am getting better with longer contours. Head shapes are coming more naturally. I’m not quite sure what happened with the man’s glasses (his left lens – on the right side of the paper).. I must have begun on with the downward stroke on the right and come around the bottom. Maybe the notch at the bottom left was how my hand saw the interaction of the man’s nose with the glasses. 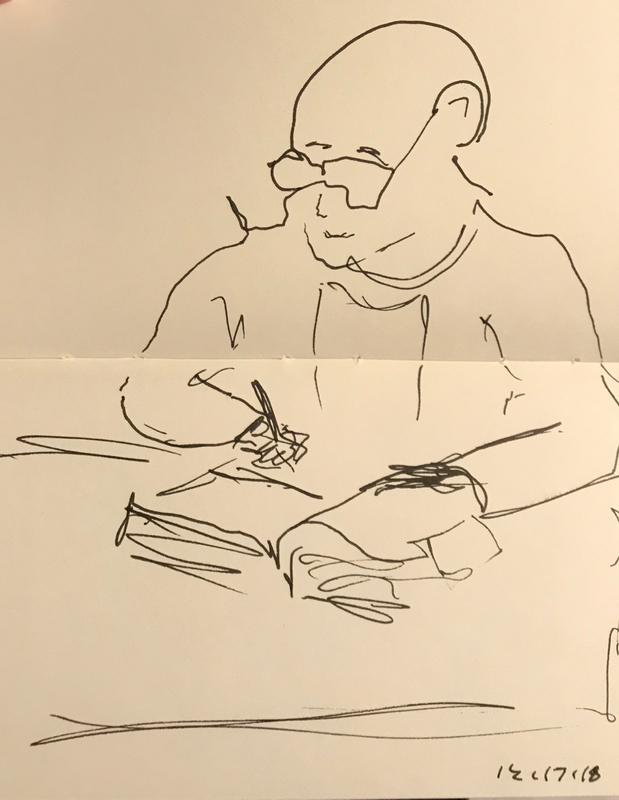 This entry was posted in Personal Stories and tagged artistic expression, artistic process, creative process, creativity, drawing, pen and ink, portrait, reading, sketch, visual art. Bookmark the permalink. I continue to love how free and expressive these drawings are. This one is great. Thanks, Claudia. I’ve been looking through my older drawings and I can see the difference. I like the free feeling that blind drawing gives me!